Araya Rasdjarmrearnsook was born in Trad, Thailand, in 1957. 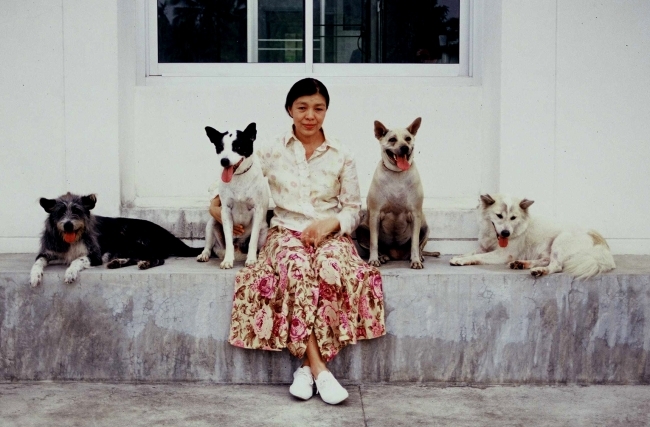 After earning both a BFA and an MFA in graphic arts from Silpakorn University, Bangkok, she continued her studies in Germany at the Hochschule für Bildende Künste Braunschweig, receiving a diploma in 1990 and an MA in 1994. Around 1998, after early experiments with intaglio printmaking and sculptural installation, Rasdjarmrearnsook began to concentrate on film and video. Her work is an articulation of personal loss and the movement between life and death, approached in a way that challenges viewers’ moral sense and tolerance through complex and provocative imagery. In Rasdjarmrearnsook’s film The Class (2005), the artist is shown directing a tutorial to a classroom of six corpses, which are shrouded in white sheets and arranged side-by-side on silver morgue trays. Confronting the diversity of cultural and religious attitudes toward mortality, the work also satirizes academic convention, the living professor teaching death to an audience already well versed in the subject. Two Planets (2007–08), a quartet of video vignettes, takes on the conventions and assumptions of western art appreciation. Deep in the Thai countryside, a group of people is presented with reproductions of 19th-century European masterpieces. The subjects sit with their backs to the camera and their untutored dialogue is subtitled in English. Their responses reveal myriad social and cultural nuances, while their perspectives on the works are entirely lacking in pretention. Exploring the interactions between opposing but connected realms—life and death, human and animal, conditioned and unconditioned—Rasdjarmrearnsook presents a meditative rethinking of the meaning of periphery. Rasdjarmrearnsook’s work has been installed in solo presentations at international institutions including the National Gallery, Bangkok (1987, 1992, 1994, 1995, and 2002); Tensta Konsthall, Stockholm (2003); Bass Museum of Art, Miami Beach (2012); and Walters Art Museum, Baltimore (2012). In addition to regular appearances at biennials and other periodic exhibitions including the Sydney Biennial (1996 and 2010), Istanbul Biennial (2003), and Documenta 13 (2012), the artist’s work has also been shown in group exhibitions internationally, at venues including the Kiasma Museum of Contemporary Art, Helsinki (2001 and 2007); Fine Arts Museum, Berne, Switzerland (2006); National Art Gallery, Singapore (2010); National Museum of Art, Osaka (2011); and Asian Art Museum of San Francisco (2012). Rasdjarmrearnsook, a lecturer at the Faculty of Fine Arts, Chiang Mai University, lives and works in Chiang Mai.